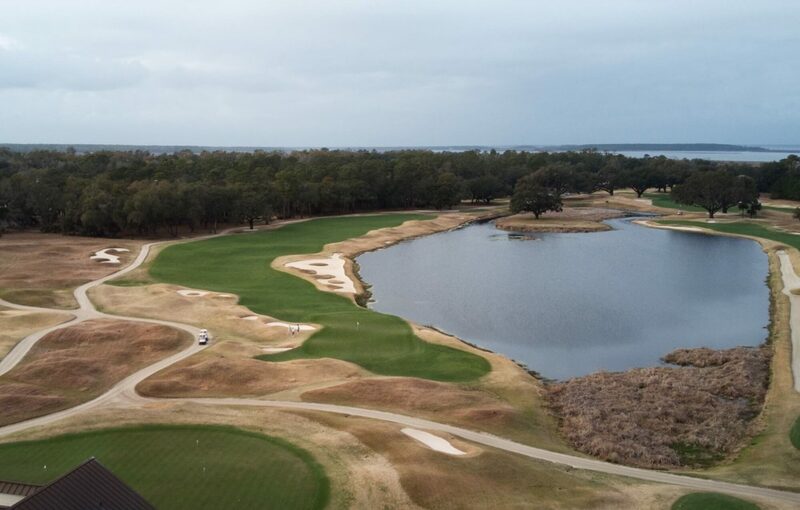 Hilton Head Island, S.C. has a reputation for being a heavy-hitting golf island, but if you take private courses into account, Bluffton, S.C.—just inland from Hilton Head—gives the island a run for its money. 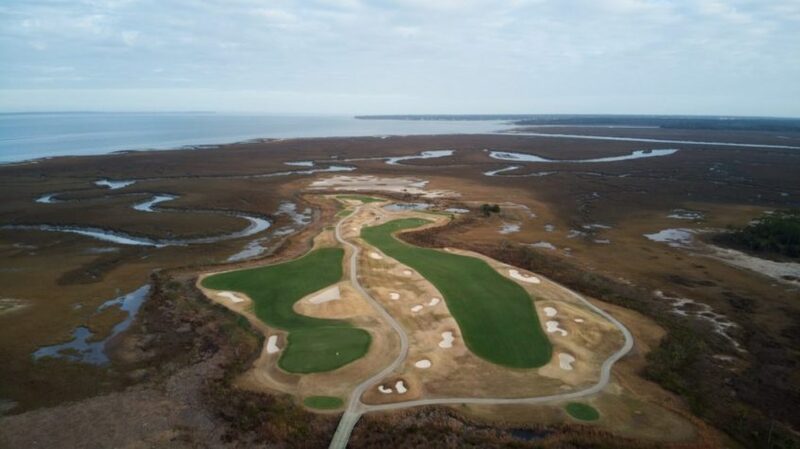 On the mainland you’ll find Belfair with its two Fazio courses, Berkeley Hall with its two Fazio courses, Colleton River Club with its Nicklaus and Dye courses, and a handful of other courses all worth considering. The issue is that many of those courses I named are private and in turn aren’t viable options for the average golfer’s trip. 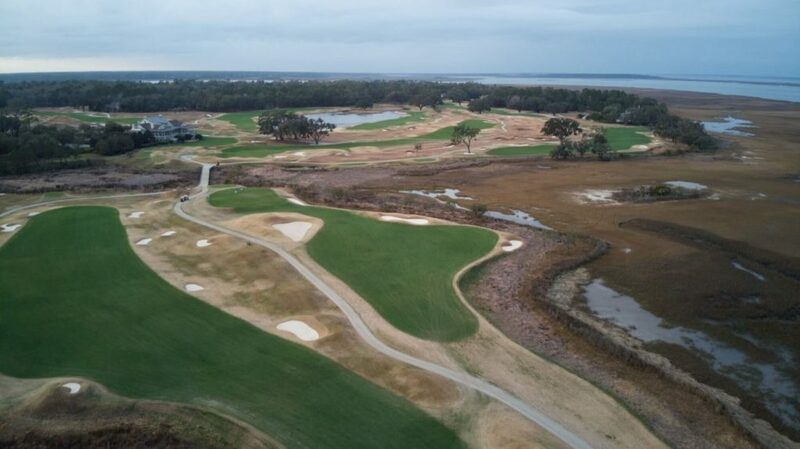 If just comparing quality, you could easily put those six named courses up against Hilton Head’s top six any day. 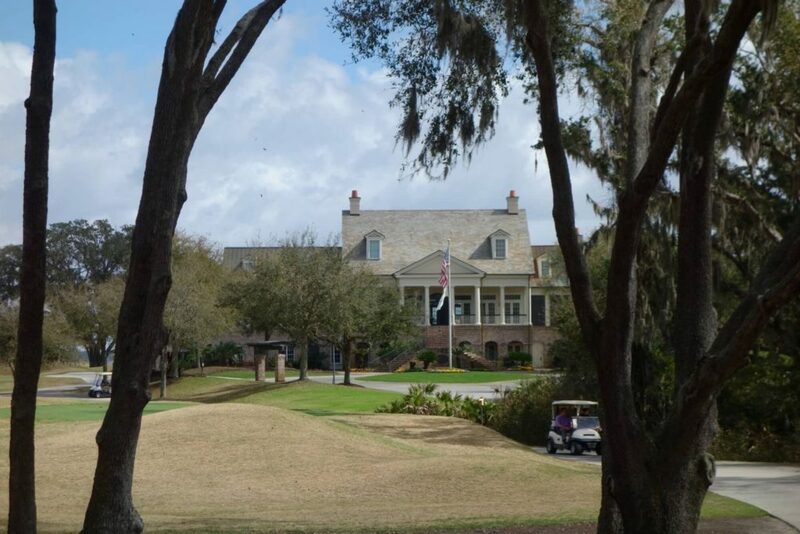 Of the Bluffton private courses, Colleton River’s two rank near the top. 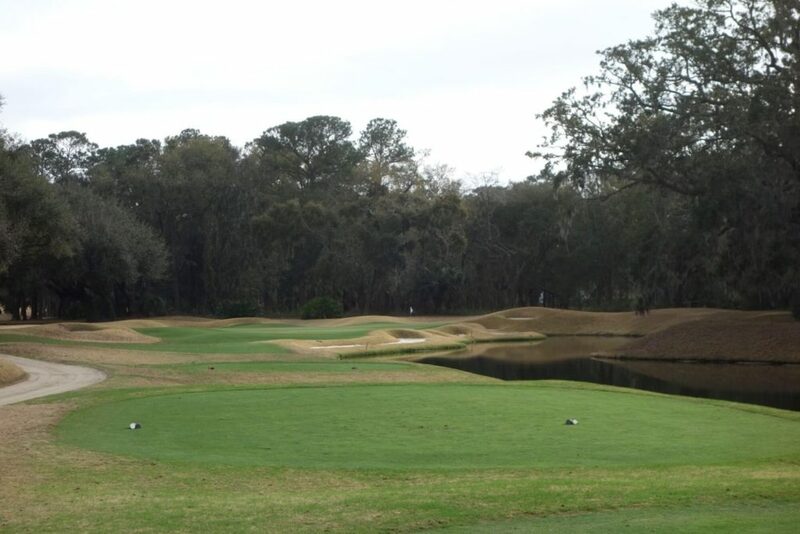 Both play along the Colleton River (the club’s namesake) and have some really strong holes. 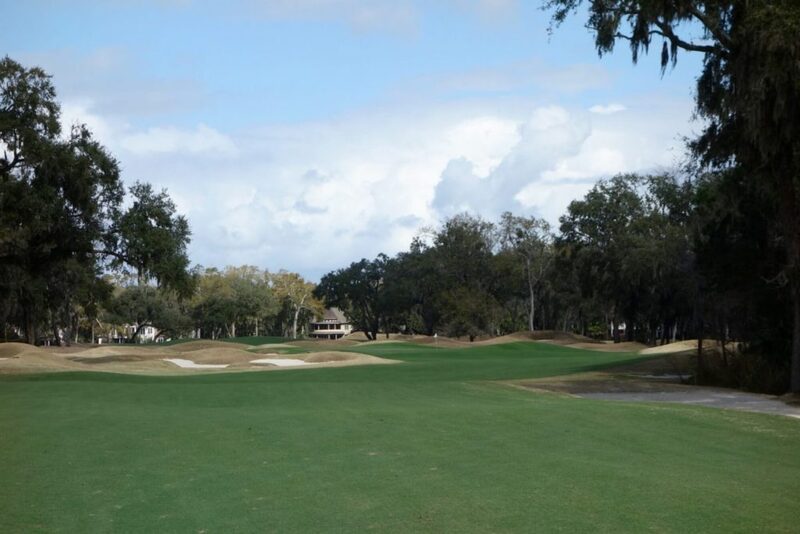 My favorite of the two is the Dye course, which is more open than the Nicklaus. Much of the back nine is routed along the marsh and a beautiful clubhouse overlooks almost all of it. 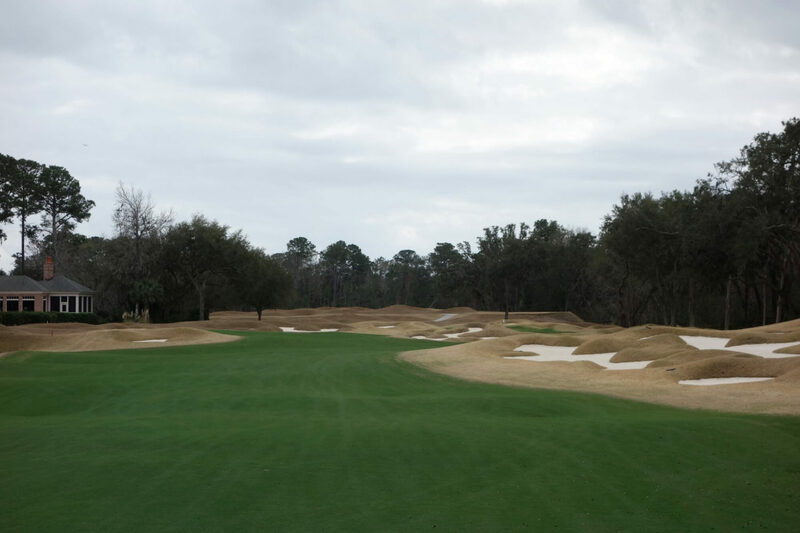 The Dye Course is an interesting look at what a designer can do with a flat piece of land. 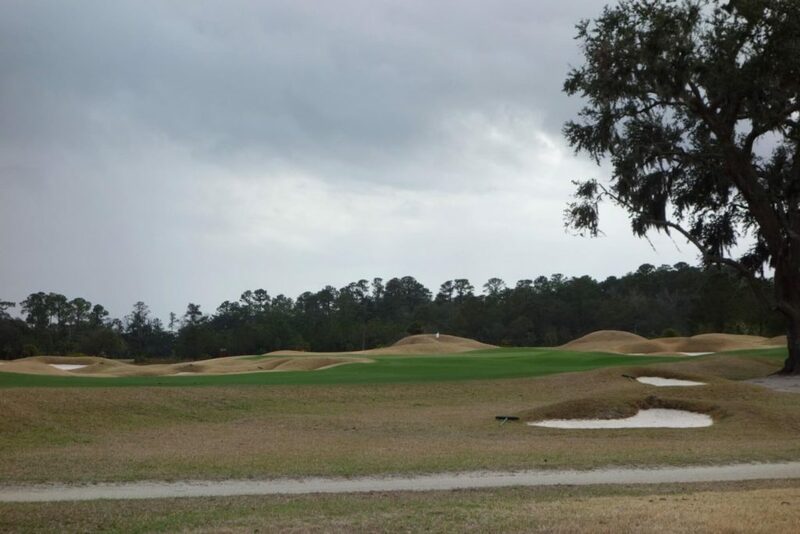 Dye used mounding and bunkering to create interest along with the marsh and water hazards on the back nine. 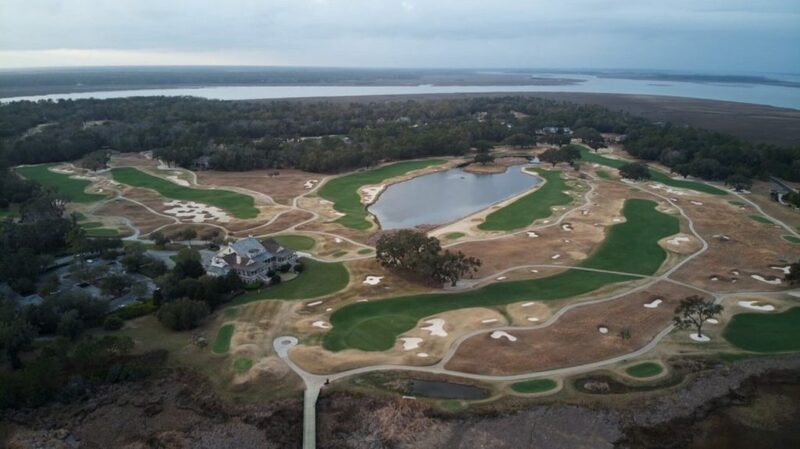 The site is comparable with two other nearby Dye designs—Long Cove and Heron Point—but neither of those use bunkering and mounding in the same way as Colleton River. Many of the holes on the course feel like they’re raised above the landscape and are separated from each other with mounds. Look for that in the hole-by-hole section below, starting with the first fairway. 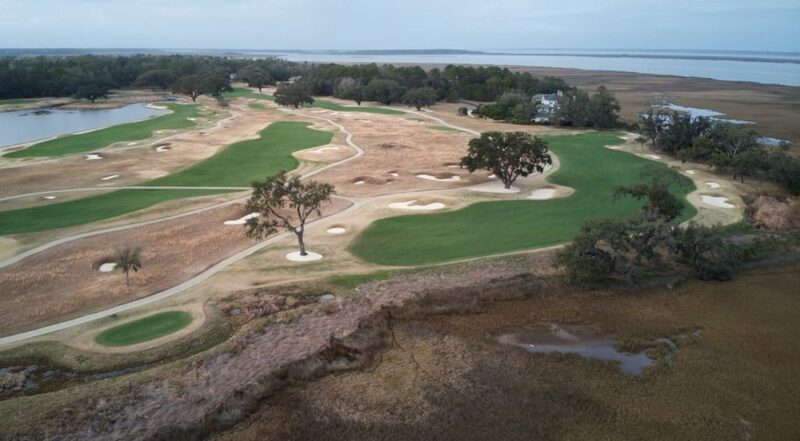 The Colleton River Dye Course underwent a renovation in 2016 that re-grassed areas of the course and expanded the green sizes back to their original footprints. There weren’t any major architectural changes. 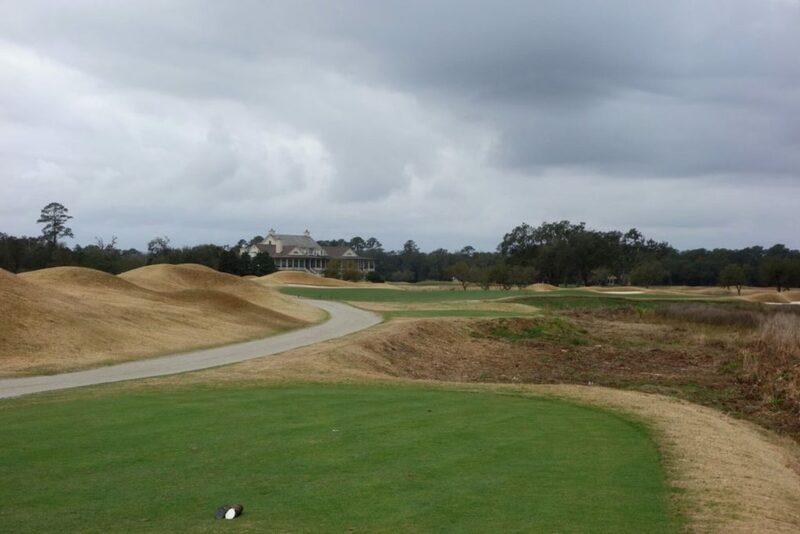 The tone is set at Colleton River during the 4-mile entrance drive through the Victoria Bluff Heritage Preserve. 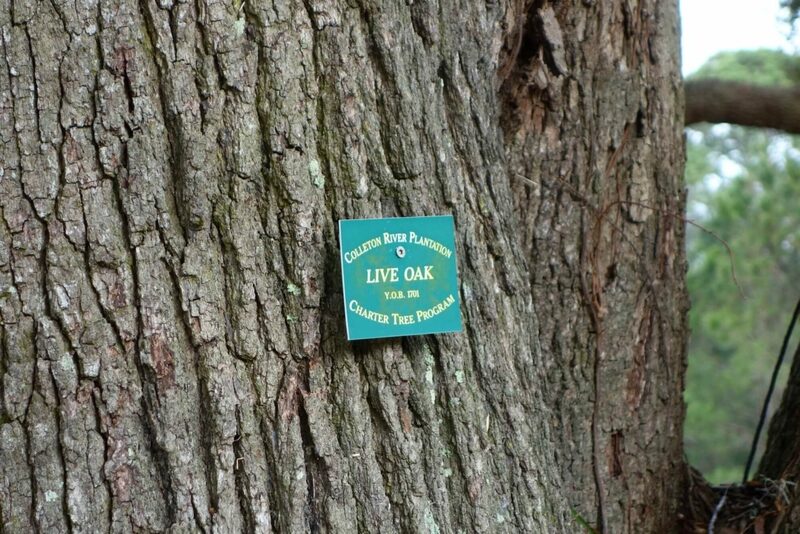 The community has done a good job maintaining much of the natural feel and they’ve added nice touches like name plates stating type and age on all of the old growth trees in the area. 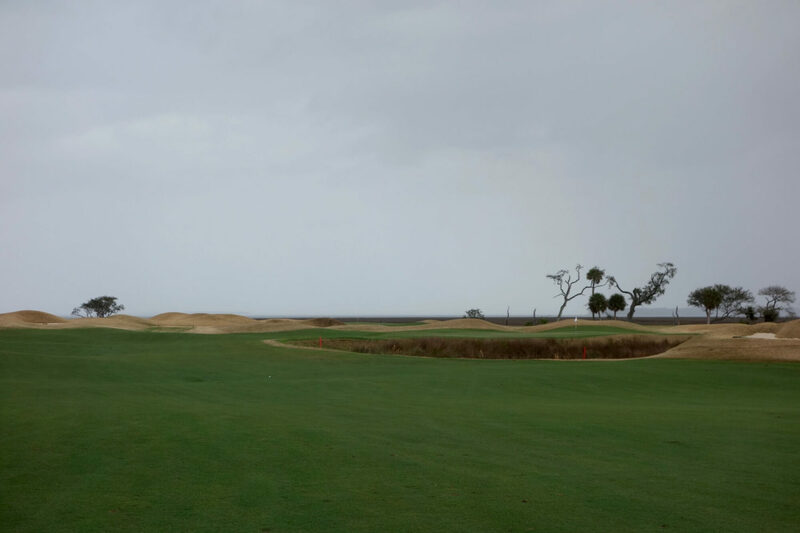 Hole #1 – 327 yards – The opener is relatively easy with a wide fairway raised above the flat level of the surrounding marshland. The green is protected on the right side and isn’t too penal early in the round. 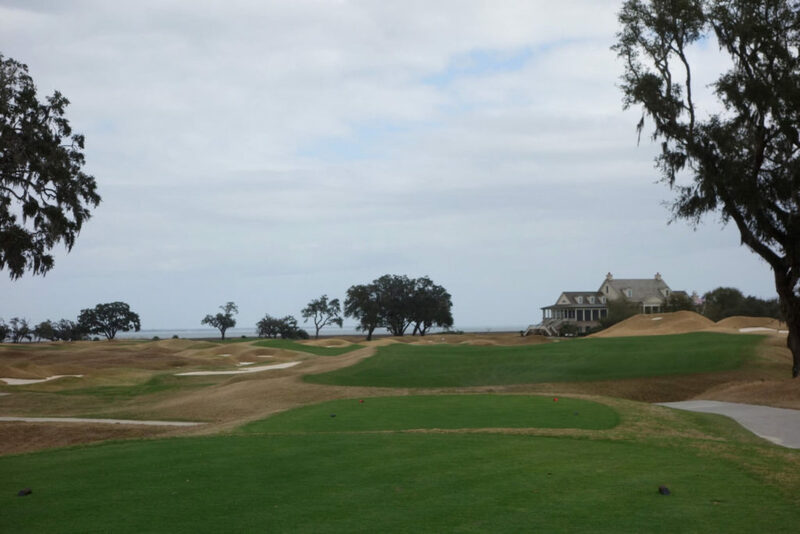 Hole #2 – 489 yards – This par 5 feels like others you find in the Lowcountry and down the road at the Colleton River Nicklaus Course. 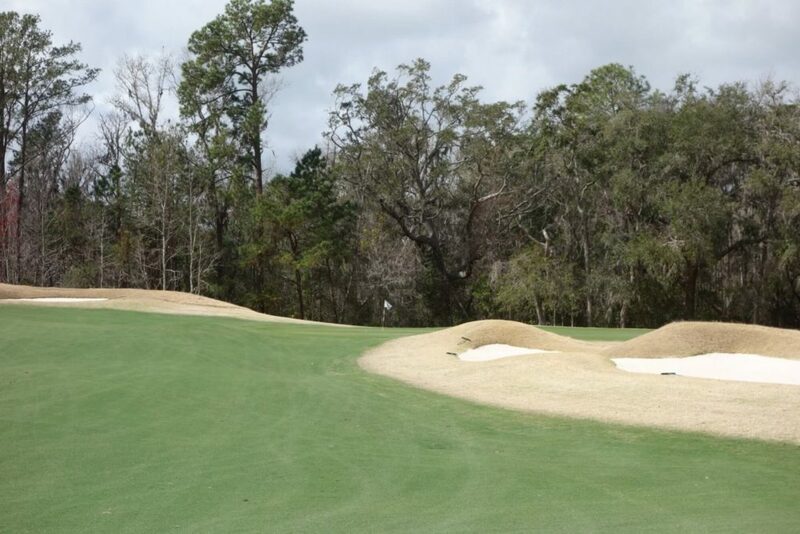 Bunkers define and frame the fairway leading to an angled green. Hole #4 – 425 yards – The huge green surround on this hole is interesting, especially with the two pot bunkers that complicate any left miss (see the second picture below taken from the side of the green). Running ground play is definitely an option, but miss in the wrong place and you have to loft it over those bunkers. 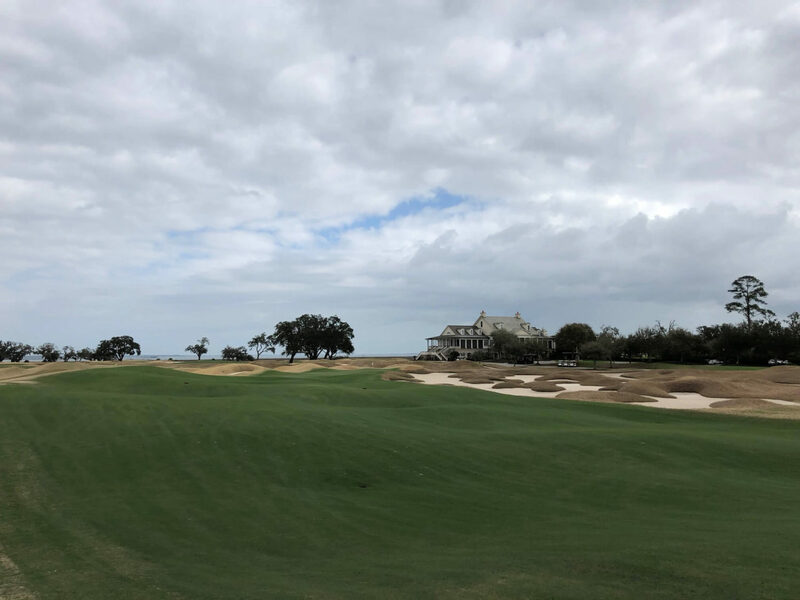 Hole #5 – 358 yards – This dogleg left has another built-up fairway that stands at least 10-15 feet above ground level off the right side of the hole. 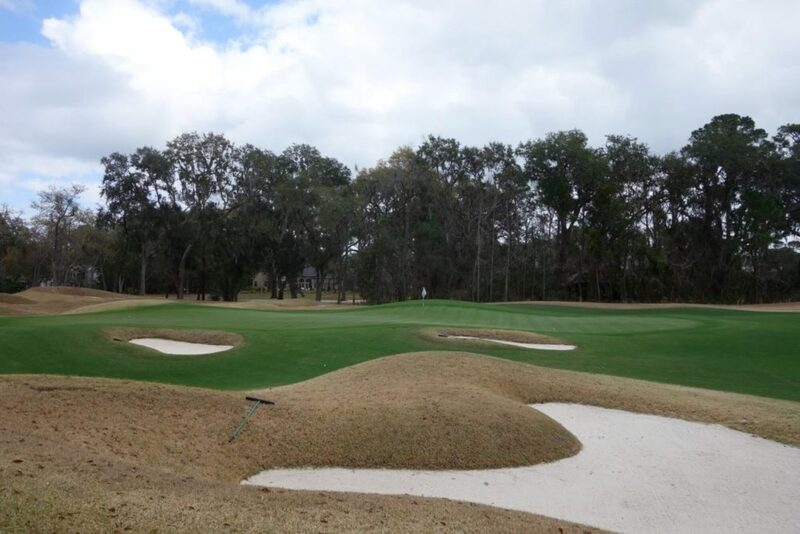 The green works away and to the right of players forcing a carry over a bunker to a back pin. 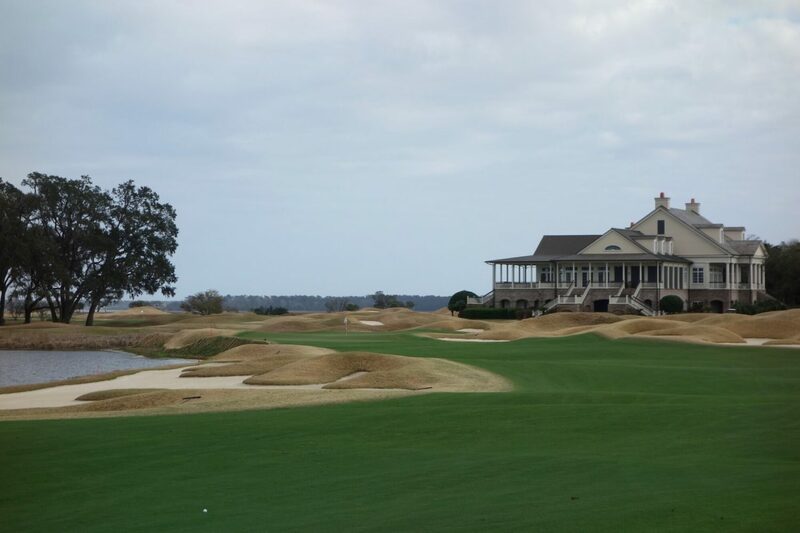 Hole #6 – 167 yards – Our group recognized this hole as one you’d likely see at a course like Tobacco Road. The mounds and layers on this hole make depth perception difficult. I thought my shot was 15 feet short, but it was actually 10 feet past the pin. The deep green also offers a ton of different pin options. 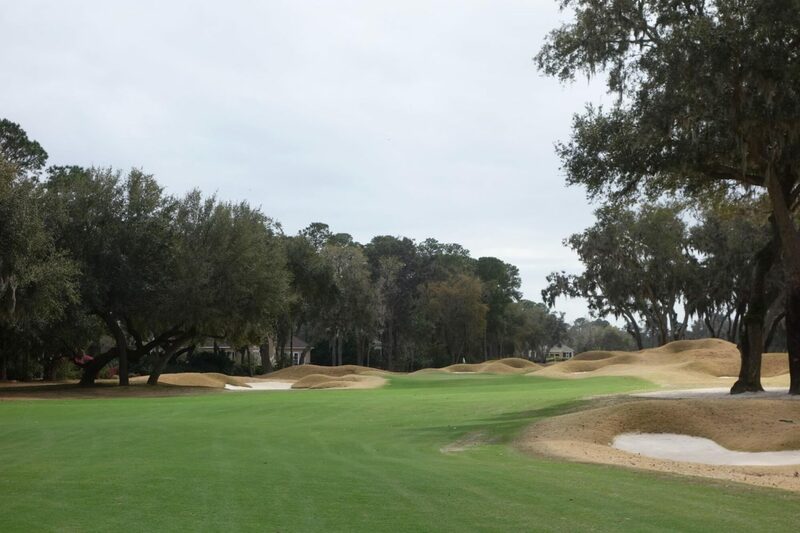 Hole #7 – 381 yards – This dogleg right leads to a green set inside a horseshoe of mounds that seem to draw inspiration from the dune surrounds in Ireland and Scotland. Hole #8 – 524 yards – After only one round I don’t understand the best way to play this par 5. I laid up to 105 yards and had a totally blind shot into the hole due to a large mound short left of the green. That mound also prevented me from going for the green. Next time I’m going to go for it and aim to miss short right, if anywhere! Hole #9 – 386 yards – The ninth is a water-less version of the 18th and is another fairway raised well-above the regular land. 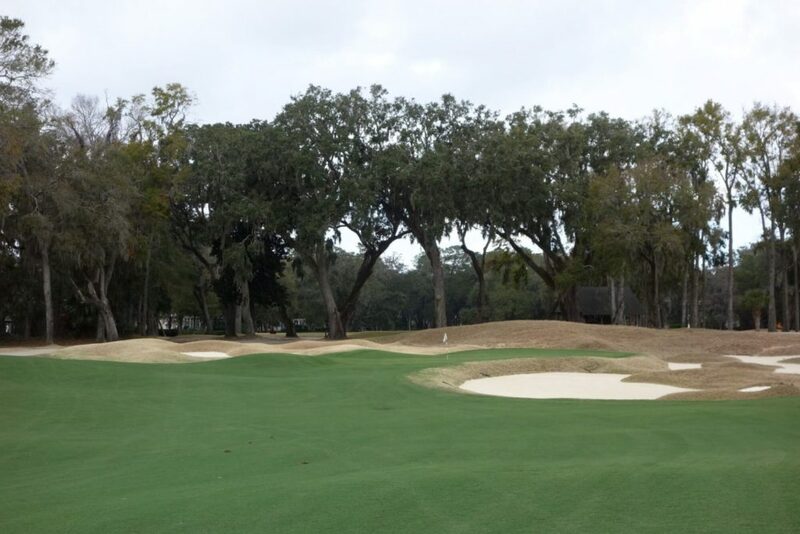 The green is guarded by mounds on the left and bunkers on the right. Challenging the left bunkers off the tee leaves a shorter approach into the green. The 9th also marks the departure from the tree-lined part of the course. 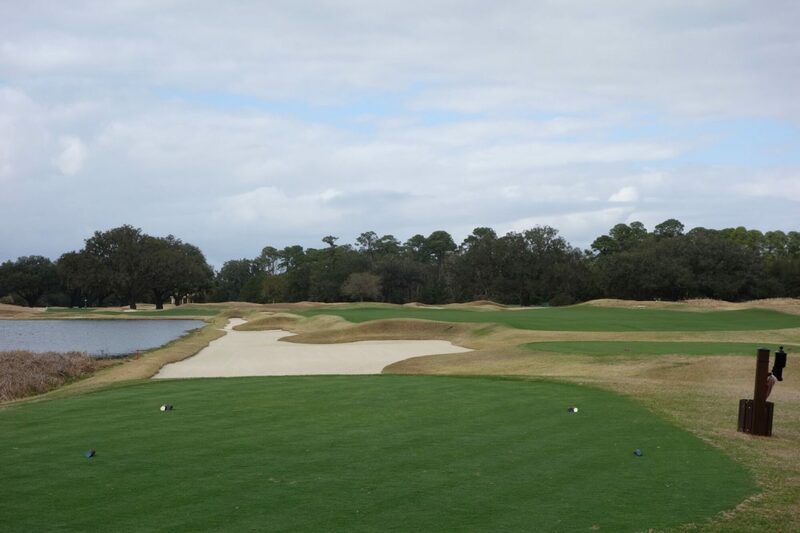 Hole #10 – 354 yards – This dogleg left works toward a green bordered by a thin bunker and lake. The tendency is to bail out right on the approach, leaving a tough chip or putt toward the water. 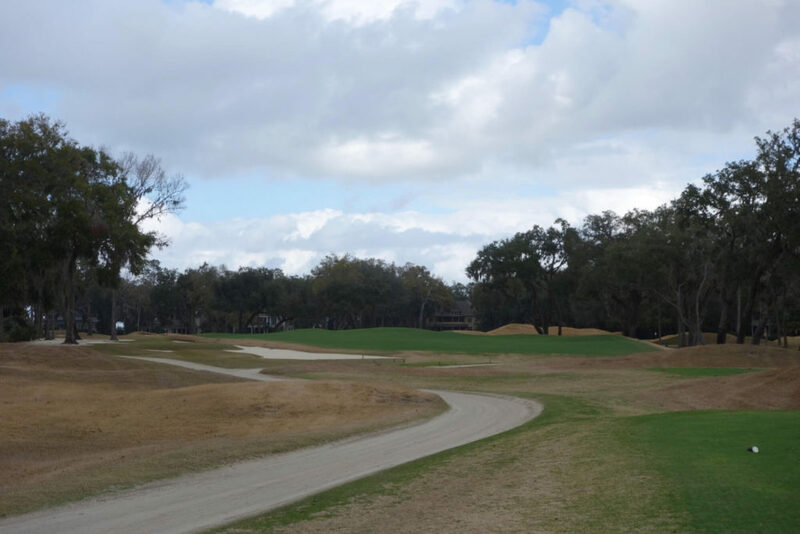 Hole #11 – 523 yards – This long par 5 meanders both directions and finishes at a green that works away and left from players. Front pins are easy and accessible here and a back pin adds real challenge. 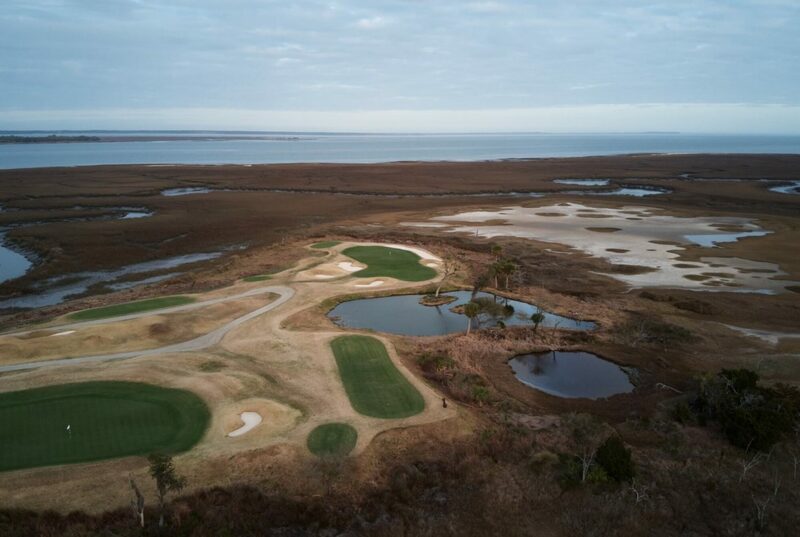 The drone shot below is taken from above and behind the green looking back at the tee (and while you’re looking from above, notice some of the crazy and random little bunkers seemingly in the middle of nowhere). 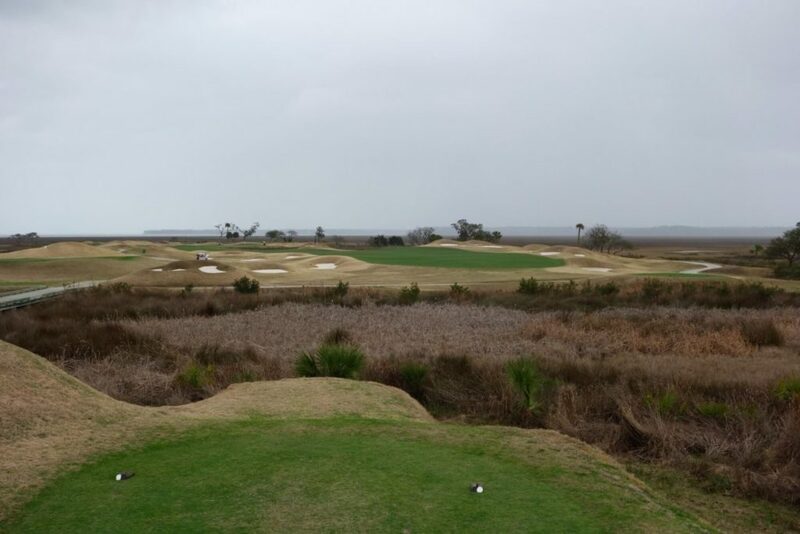 Hole #12 – 396 yards – The twelfth hole starts a three-hole stretch on a peninsula jutting out into the marsh (see opening photo of this review). It’s a tough driving hole with pot bunkers looming and an approach shot with a forced carry over the marsh. Fortunately the green is massive with plenty of room long to avoid the water. 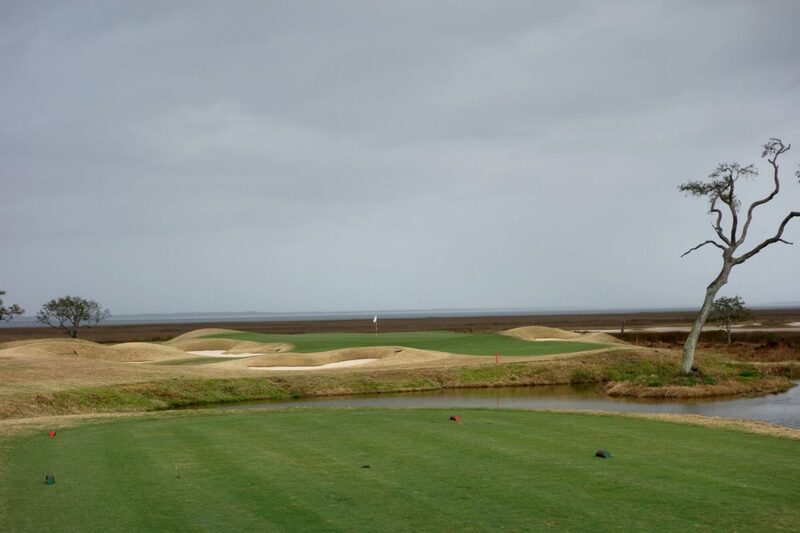 Hole #13 – 127 yards – The hole furthest out on the peninsula, the thirteenth is a short par three that is totally exposed on the flat landscape. A center or front right pin is easiest here, but move the pin back left and you’re holding on for dear life. 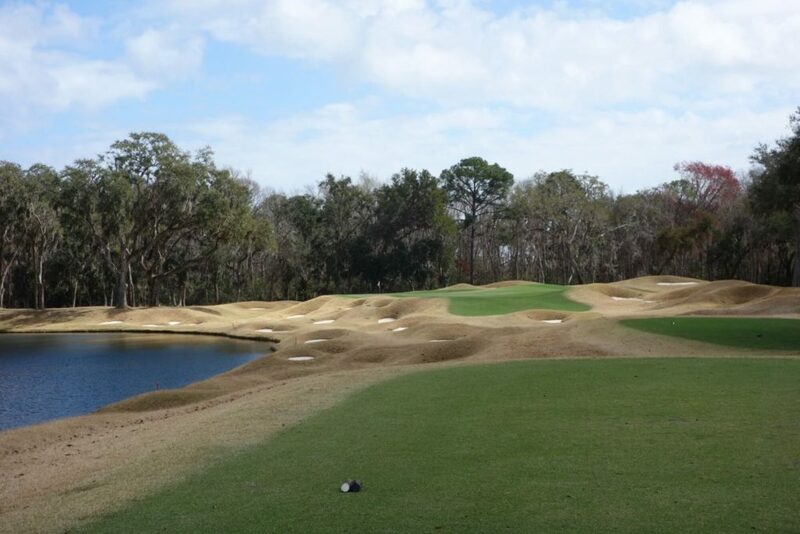 Hole #14 – 303 yards – Dye showed off some great architectural strategy on this one. The green, hidden behind a tall mound and bunker, is located in line with the clubhouse. 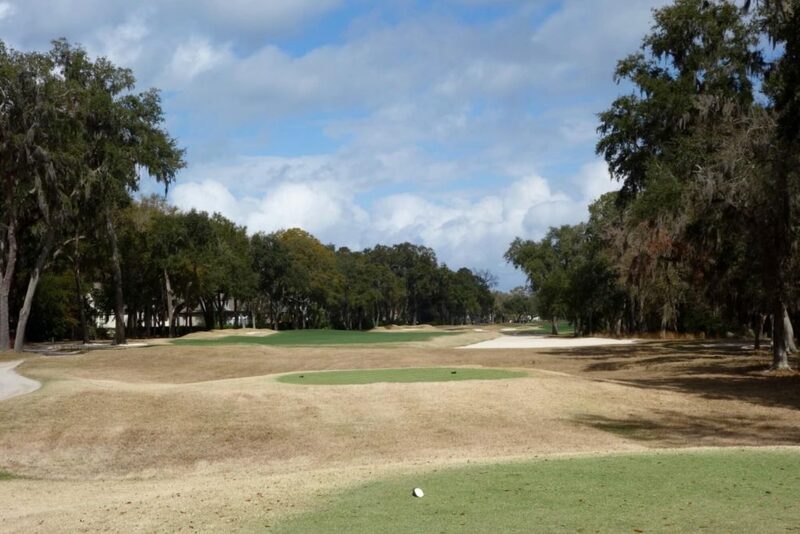 A tee shot down the left is the safest play, but it leaves a blind approach. 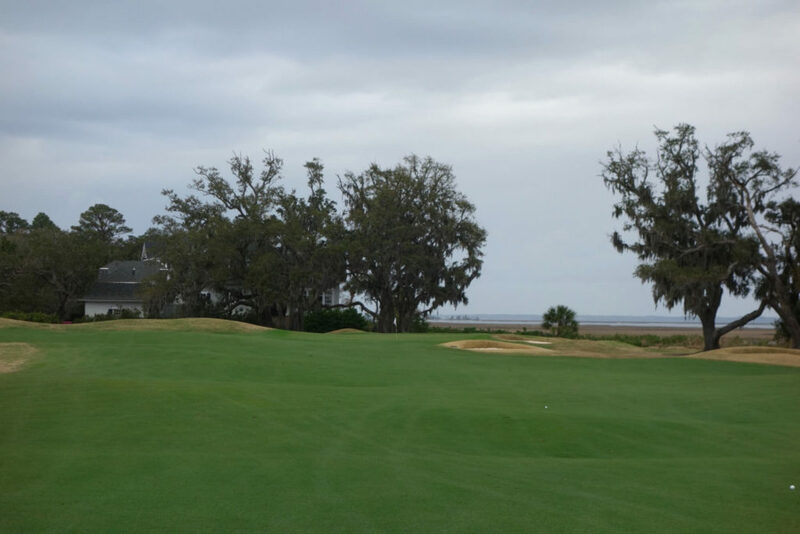 Golfers who challenge the marsh and take their tee shot out toward the bunkers have a much better approach angle. Further, a third option for really long players is to blast a drive over the mound onto the large green. 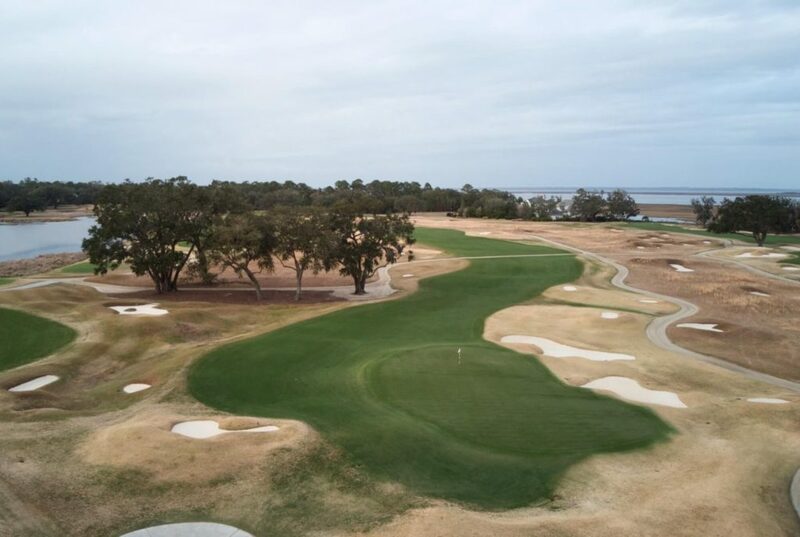 The aerial shot below gives a great look at this hole’s shape. Hole #15 – 396 yards – A couple of live oak trees narrow the tee shot on this dogleg left par 4 along the marsh. 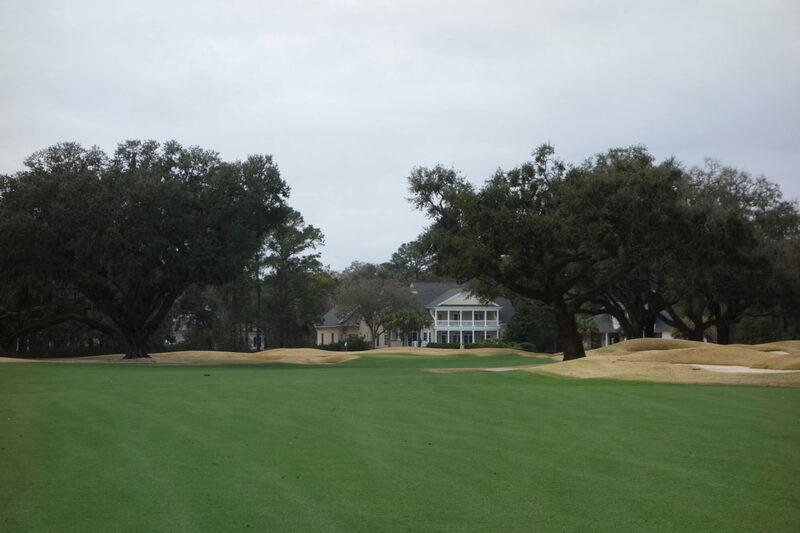 Hole #16 – 502 yards – This par 5 has an open tee shot, but a grove of large live oak trees choke the approach to the green. The trees force accuracy for layups and add challenge for those going for the green. 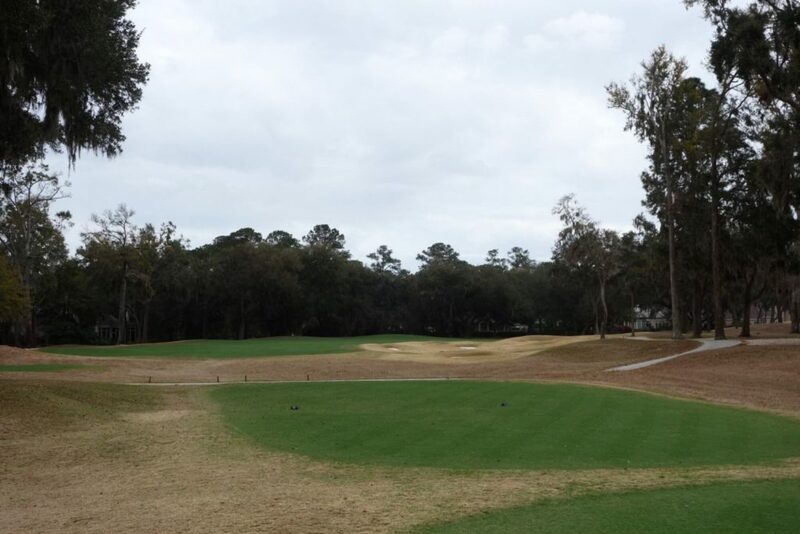 The green itself is wide open, but you’ve really got to think strategically on the layup and approach shots. 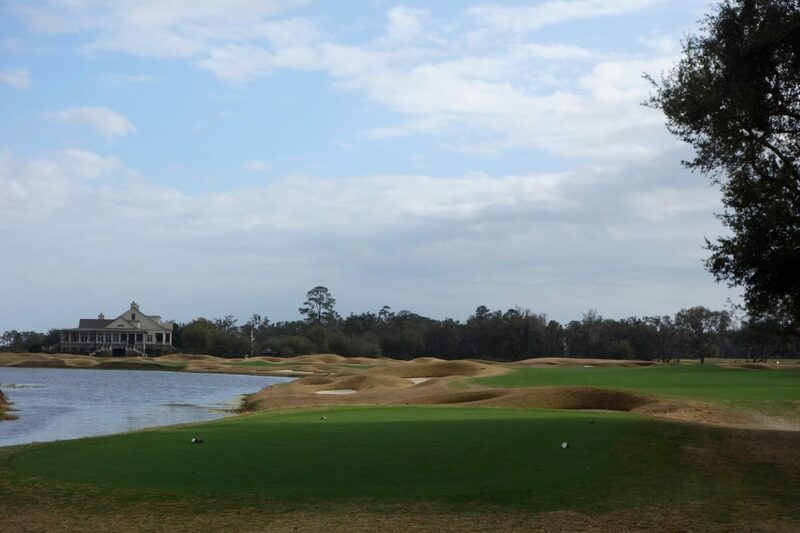 Hole #17 – 186 yards – The last par 3 on the course borders a lake. The pin seen below is the toughest on the putting surface… center green is the line in nearly every case! Hole #18 – 410 yards – The strong finisher is a dogleg left hugging a lake and more pot bunkers. 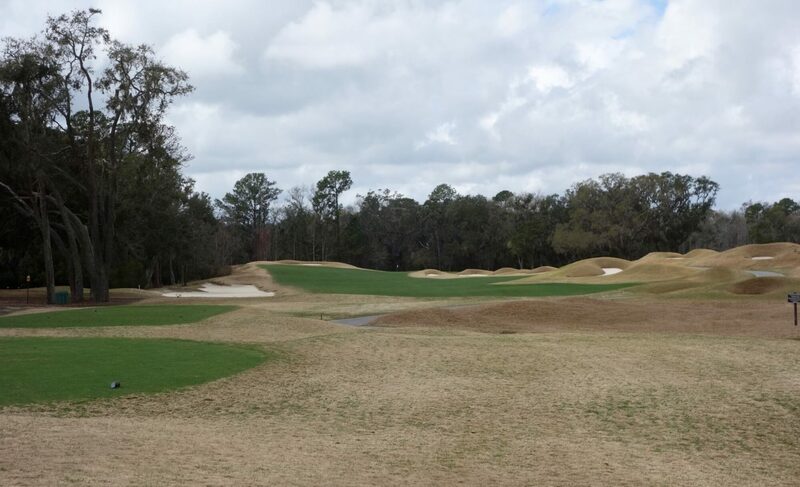 The multi-tiered green slopes right to left, allowing players to aim away from the water and still get to a left pin. There are some really interesting architectural features at Colleton River’s Dye course. It’s the type of place you finish playing and immediately think back to a handful of holes that you’d love to play again. 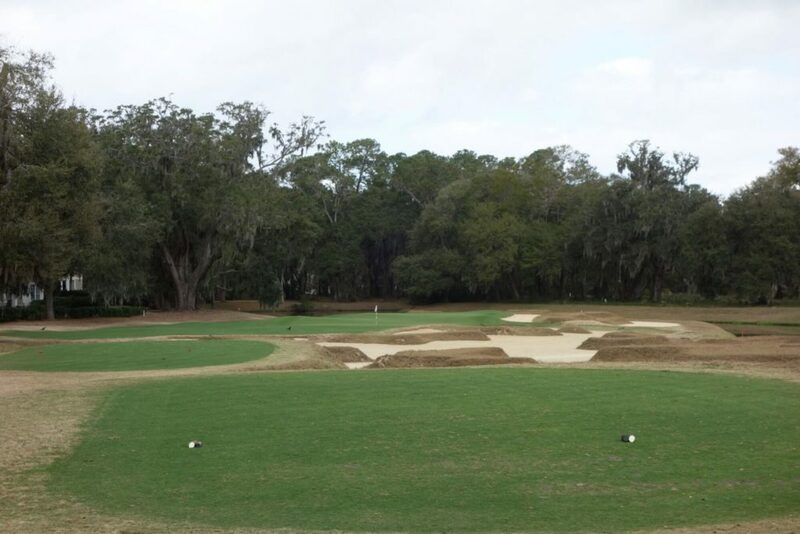 I still can’t get that third hole out of my head… what a cool use of a Redan on an otherwise flat piece of property! The Dye course remains one of my favorite in the area. *On a separate note, I’d love to hear from you guys about the use of drone photography in these reviews. Did you like seeing the holes from a different angle? I think it really helps show hole shapes and angles that can’t be seen from ground level. Drop me a comment below with your thoughts. Definitely enjoyed the review and the addition of the drone shots are great! I’m sure there’s quite a bit of extra effort involved to capture those, but they definitely provide a useful perspective. Keep up the great work! Thanks for the great review. 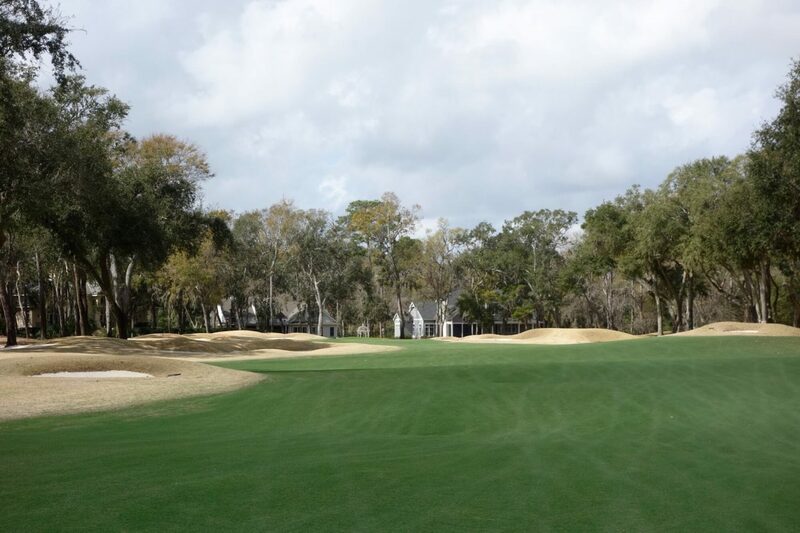 Having been involved with the restoration in 2016 (and receiving the ASGCA Design Excellence award) as well as the original construction I believe it is one of Dye’s best.